I think I found my physical limits with the 100k a week ago. I would say it has taken a week to fully recover, but that would imply I am fully recovered. From speaking with the others who did the 100k challenges it seems most people have felt the post challenge fatigue in one way or another this week, which is reassuring. I felt good from Tuesday onwards, but the harder 10k on Friday pushed the fatigue into a cold over the weekend, and so the two days off were needed. I will train easy tomorrow to ease back into normal training again, and am highly motivated to get back into it. If motivation isn’t hit after a substantial race or challenge that is always a good thing, as I know a lot of people suffer motivationally with picking their next target to aim for. As I’m likely to take the weekend off to recover fully I thought I’d push today’s 10k a little more. A nice negative split plan starting at 1:50 then stepping the pace down by a second at a time. A nice cruise for most of it building into a strong last quarter, and pushing it towards the end to dip under 35:30. I started quite light (high rate for the pace) because I find this more effective for a strong negative split plan – easier than having to lighten the stroke as you go. Thanks for the comments on my report of the 100k World Record row on Sunday. One question was what was the range of stroke rate through the row, this is probably easiest to describe by going through how the 100k went from my point of view from start to finish. In the build up to the attempt we had a few discussions between the 3 teams on realistic pacing targets, both based on the records we wanted to beat, on Joe’s experience having set the 60+ male tandem record with his brother Gerry last year, and on comparison with other distances we’d done. We decided that physically we should be able to row the challenge at our respective marathon paces, so used that as the slow end of the target range, afterall if you can row 42k in one go at a certain pace how hard can 52k be with breaks? It is quite a different prospect, however, doing that 52k spread out over a 6hr30 period (52k being the distance the males were doing in these attempts). So with a marathon pace of 1:52.3 I decided on a target pace of 1:50-1:52, which as with all targets meant that I’d end up rowing at 1:50 pace. It took the first 10k to really fully warm up into the row, and with 10% down feel we were into the row. I was sweating a lot from the start and conscious I needed to drink a lot to keep hydrated (it was a hot day on Sunday). I started out pulling mainly 25spm for a 1:50 pace. Going through 25k gone I felt really good, and was pulling a few 1:49’s as well as the 1:50’s, and still at 25-26spm trying to keep the stroke fairly light. I could feel rubbing on my bum at this point though, and thought this could be a bad thing with 3/4 of the row to go. In one of the short breaks I quickly ran out to the fire stairs and changes clothes to stop the rubbing, and this also helped to feel fresher at around 30k into the row. Through to the halfway point it was all going well to plan, the spm was steady at 25-26, and the pace steady at 1:50. I should point out that Jen was rock steady at 2:00 / 25 through to this point, and looked in perfect control. It was at about 45k to go that I started to feel the pace, and know there was a long way to go still. Soon we were through to “just” a marathon to go, the first time that it was any sort of realistic distance showing on the monitor. I’ve done a number of “small team” 100k rows before, but a small team is 10 people, and this is a very different prospect (not to mention a lot faster, so it takes a lot less time!). The point it started to get much harder was at 25k to go, and this is where my stroke had to change. I started to get cramp in my forearms to begin with just below the elbow, which seems to come at extremes of movement – either when my elbows were fully bent, or fully locked out. As a result I increased the rate up to about 28spm and simply didn’t go to extremes of bend at the elbows any more. I stretched out during every rest period, but it was obvious it was really a nutritional problem. Mild cramping in other areas of my body, mainly my quads, started at around 15k to go. Again this was primarily when I straightened my legs fully, and was only really kicking in during the second half of each of my reps. Into the last 10k though it was getting much worse, and if I bent my legs too much my quads would completely cramp. To compensate I had to shorten the slide, and rate up more and more. First t0 30spm with 10k to go, and finally up to 33spm or so in the last 5k. During the last two rest periods it took about 3 to 4 minutes (or a rest period that was about 4m30 long) to stretch my quads enough to be able to even stand up straight, never mind row again. Through the middle of the row I had been looking forward to blasting the last rep when I came to it. In the final rest period I thought I was going to have to get Jen to finish the distance, and with 1min to go when I knew I could row again it was all about just getting through to the end. I started off the last rep at 1:48, and finished in with a 1:42 last stroke, but it didn’t much resemble rowing as I tried to keep the emphasis off the muscles that were cramping worse. Hence the photos at the end of my last blog entry showing simply relief at finishing rather than any sort of sense of achievement at having set the fastest mixed tandem 100k time ever. A few days later now, as I recover fully from the efforts of the weekend, I am starting to contemplate how good the row and the pace was. And now it’s time to build back into full training, and back to that sub 20min 6k aim! It’s taken me two days since the Farnborough Indoor Rowing Championships weekend has finished to write a blog entry about the weekend. It’s been a long and tiring weekend, but a successful weekend all around. 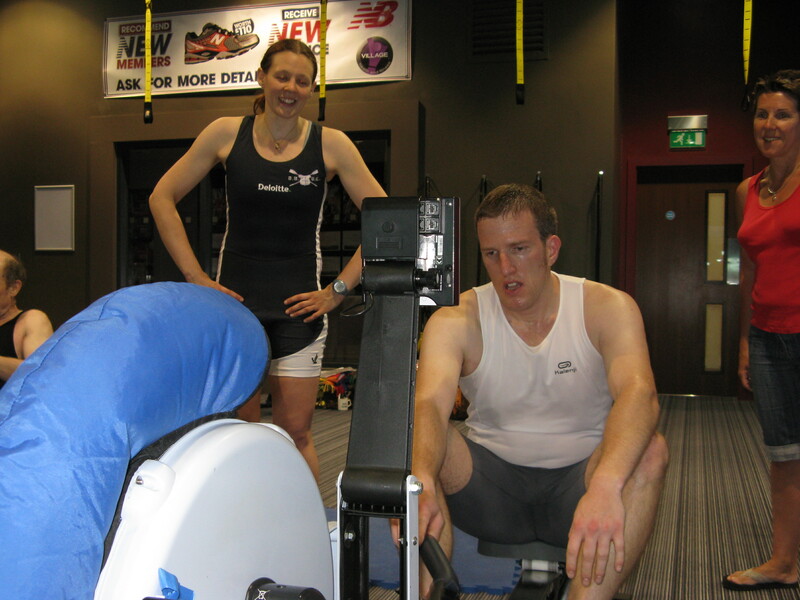 The Farnborough weekend started at 6pm on Friday evening when Ian and Jen arrived from their long journey south (via Nottingham) with the ergs. After carrying 12 ergs about 75m from the van then up 2 flights of stairs to the gym we decided we were tired and hungry and would leave the set up to Saturday morning. Saturday we were in the gym at 8.30am to get the ergs put together, the screen and projector set up, and all the other bits ready. With the first race due to be off at 10.30am we weren’t panicking at all when there was no sign of the technical team at 10am, honest… Ant and Ian downloaded the race software just in case, but Dougie and Konrad arrived to save the day, and the first race got off right on time at 10.30am. Sorting the results out during the day was made a little more difficult with having mixed racing categories and the odd person not making weight. I think we got the right prizes to the right people in the end. In the end we had 60 entries, 59 starters, and 57 finishers. Some of the others involved in the 100k’s on Sunday were going to take it slightly easier in their 5k’s. I was hoping to be able to save a little bit and perhaps still win my heat, but I knew the competition would be strong. I got off to a good start and by pulling 1:41’s and 1:42’s got out to an 11m lead at one point during the middle of the race. I perhaps got a bit complacent here thinking that the competition weren’t going to be as strong as I thought and eased off a little in the 3rd and 4th ks. Coming towards the final k I was sitting somewhere around 6m behind the leaders, with the lead changing stroke by stroke on my monitor between Richard Cheeseman and Dave Blanksby. I thought at this point I could take them in the sprint at the end, and would keep the distance about the same then blast the end. They pushed off each other a bit, and before I was ready to start a sprint for the line Dave was off pulling 1:32’s from 300m out and there would have been no way to overcome the deficit. I increased speed at the end to pull in with a 16:58 with a 1:40.5 last km, finishing in 3rd behind Dave in 16:53 and Richard in 16:56. Far closer to maximal effort than I ideally wanted the day before the 100k, that’s for sure. Sunday was the big day. 3 teams going head to head for 100km pairs World Records. Rather than describe the day and the long row in too many words I will illustrate it mainly with photos. I will of course concentrate my commentary on the row I was doing, but I will include the results of the other two pairs at the end. 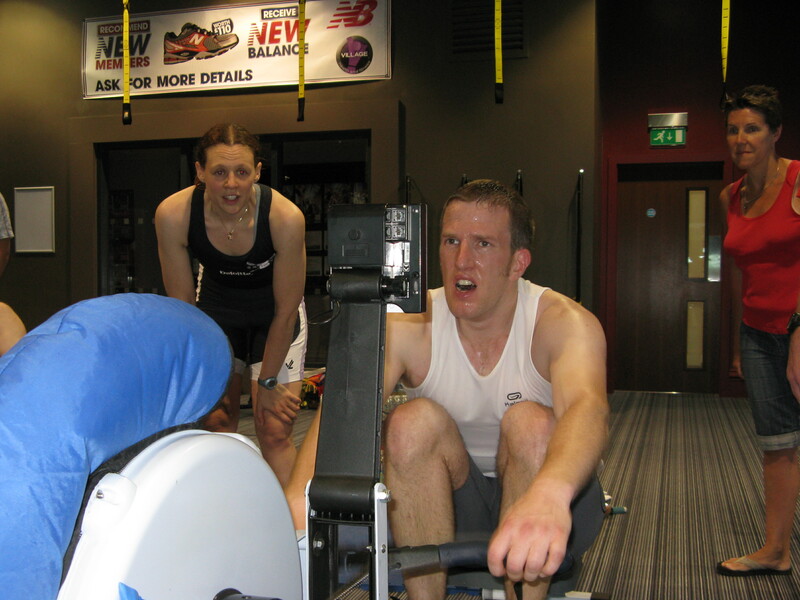 I was in a pair with Jen Howse, and our aim was to beat the overall mixed tandem World Record time of 6 hours 33minutes (and a few seconds). 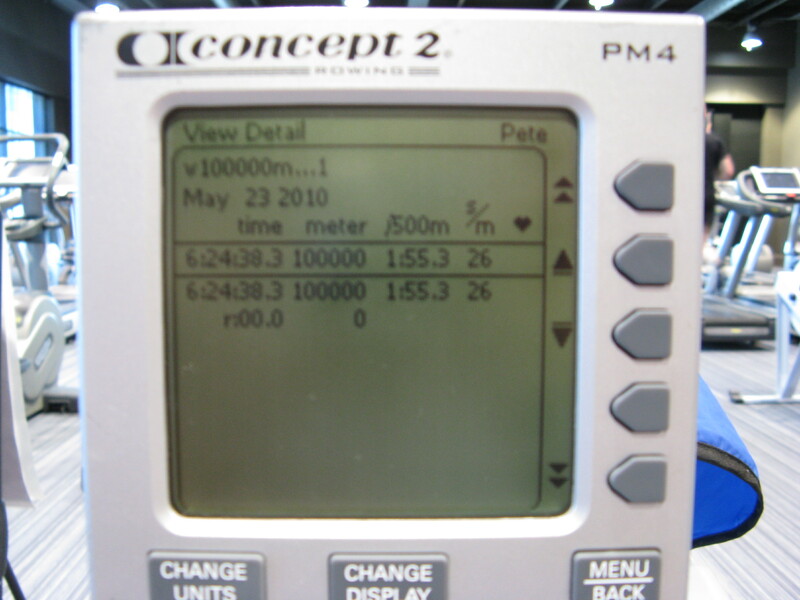 Our tactics were to split the row into 40 x 2500m sections, and in each section for Jen to row 1200m then me to row 1300m. The rules of the 100k tandem World Record is that each team member must complete at least 40% of the distance, and this tactic would put us at 48k for Jen and 52k for me. This gave us a lot of leeway if anyone had any issues during the row and needed a longer rest period. The three pairs set up in the gym with enough space around for changing on and off the machine, and nutritional supplies for the long day ahead. Nutrition was always going to be the key thing as we would be rowing for around 6 hours 30mins, and doing it roughly as 5mins on / 5mins off. This would leave very little time to eat or drink anything much, but equally no time to get cold. Of course little did we know a few weeks ago that it would be 30degrees C on Sunday, and getting cold would never be an issue! The pacing plan was roughly 2:00 for Jen and 1:50 for me, so with changeovers taken into account this should put our average split something in the 1:55 – 1:56 region. With a target of 1:58.0 for the World Record this was going to give us a good margin for any tough periods later in the row. 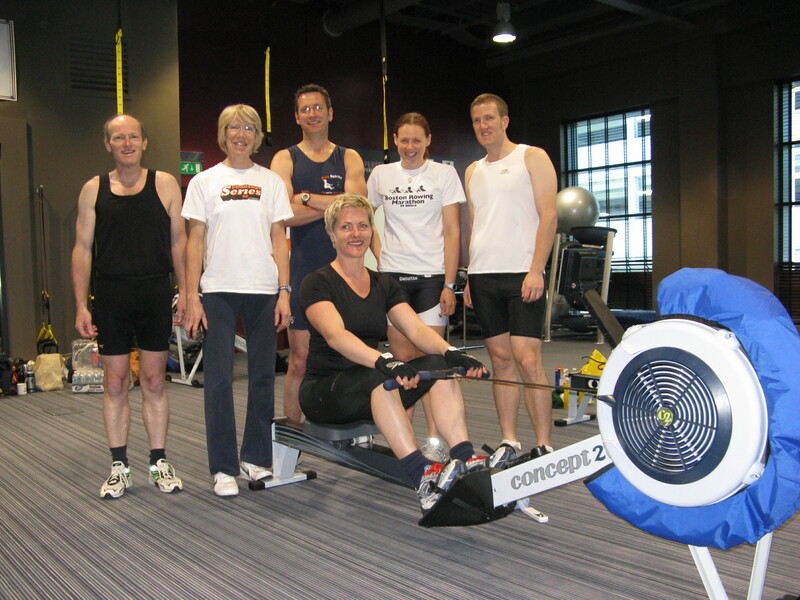 All of the teams just prior to the start – from left to right Joe Keating and Georgina Price targetting the 50+ world record, Steve Smith and Jo Andrews (seated on the erg) targetting the 40+ world record, and Jen Howse and Pete Marston targetting the overall world record. And we were off. It took the first 20km to get into a rhythm, and it was around this point I felt most comfortable. 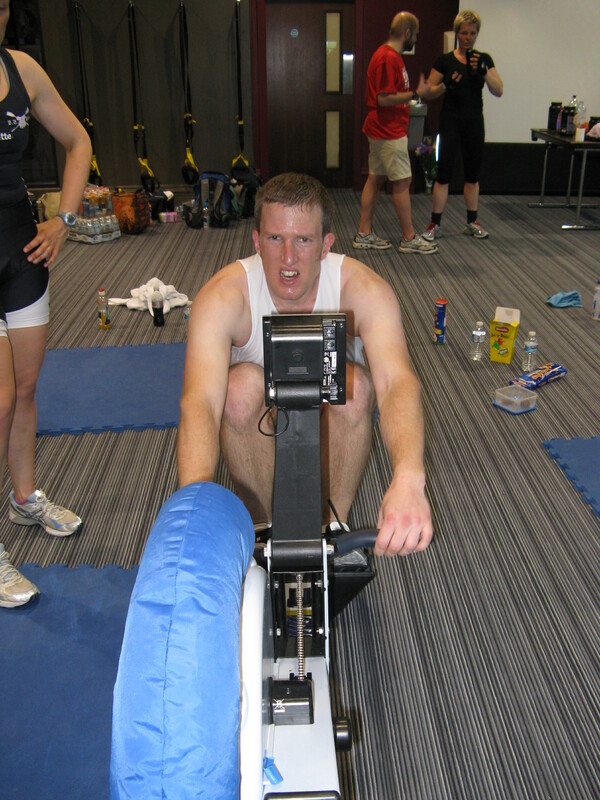 I seemed to acclimatise to the heat at this time, close to 90mins into the row. Approaching half way the enormity of the challenge started to hit me. We’d been rowing for over 3 hours, and we have over 3 hours to go. It was at 45km to go that it started to get physically tough though. The full set up of the three teams is shown well by the photo above, set up in the Velocity gym within the Village hotel in Farnborough. And finally the relief at crossing the line and not having to pull the handle any more! A finishing photo – yes I know Jen looks a lot fresher than I do! The final time of 6hours 24minutes 38.3seconds beats the old World Record by around 9minutes. 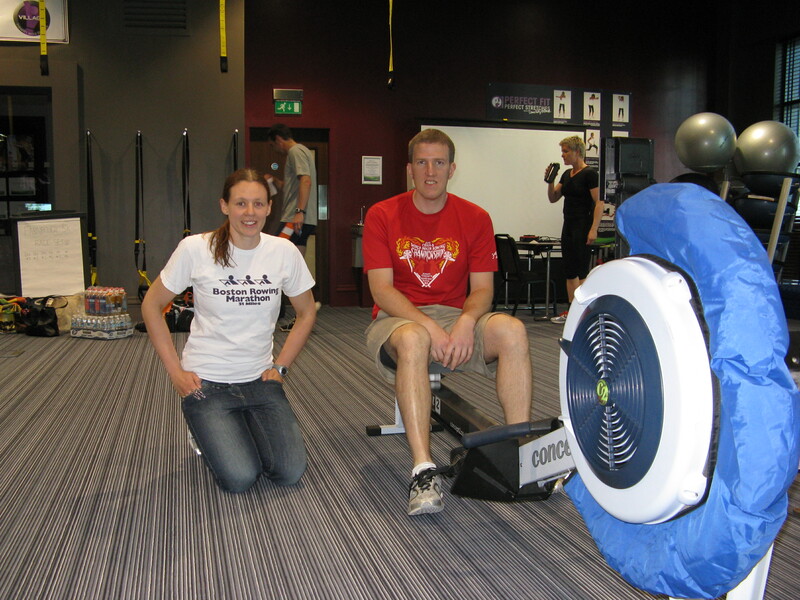 Joe and Georgina set a new 50+ mixed World Record with a time of 6hrs 57mins 52.1secs (2:05.4 average pace). 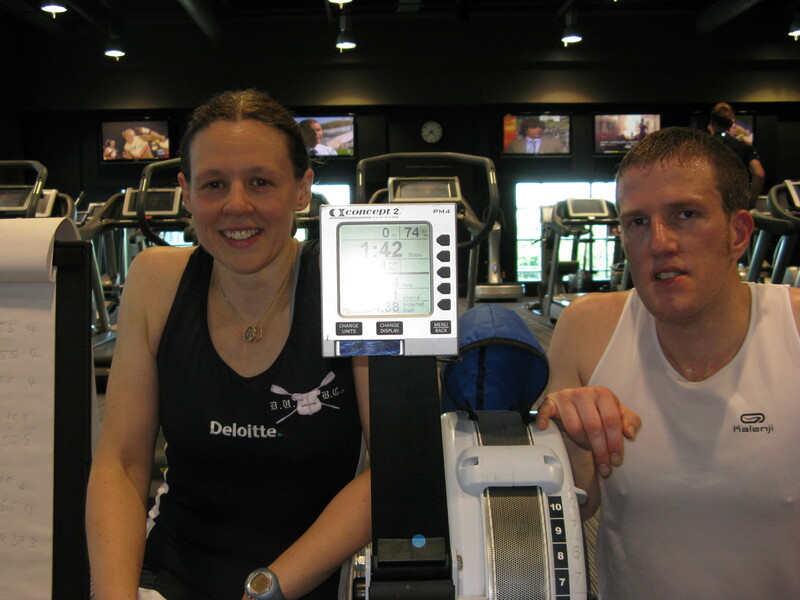 Steve and Jo set a new 40+ mixed World Record with a time of 6hrs 40mins 26.8secs (2:00.1 average pace). Well done to all six of us, same time next year? The good thing about keeping detailed training diaries is that you can look back to the training running up to any race or test piece to give you a good idea how your form is. I pulled out my 2005 training diary to see what training sessions I’d done in the run up to my 5k pb, a 16:33.6 at a race in Norfolk on 20th August 2005. The majority of the interval sessions I did in the run up to that race were at very similar paces to those I’m doing now. The big thing that jumps out in the training diary in the period up to that race is the number of single distance hard rows I did in the gym. Multiple sub 17min 5k’s, lots of sub 35min 10k’s (at fairly low rates for me, so not maximal), and a few sub 6:20 2k’s. There is no real substitute for the mental boost these hard pieces give you that the interval training doesn’t really fully satisfy. That said, taking the training as a whole in the 2 months leading to that 5k I am definitely within 1second of pace on everything, therefore I am physically capable of a time around 16:44. With that in mind, today’s final session at pace was looking towards a pacing plan aiming for a mid 16:40’s time. Fairly comfortable, as it should be. The plan for Saturday will be to aim for 1:41 to 1:42 for the first 3k, trying to get to that point physically within myself (although only a little). Hopefully with an average split of 1:41.5 give or take a couple of tenths at the 2k to go point I will then aim to slowly increase pace, judging the competition, and sprinting the end. I am not physically capable of a new pb at the moment, so I will be racing for the win rather than a time specifically. I truely believe I can outsprint anyone in the race if I’m close to them with 500m to go. 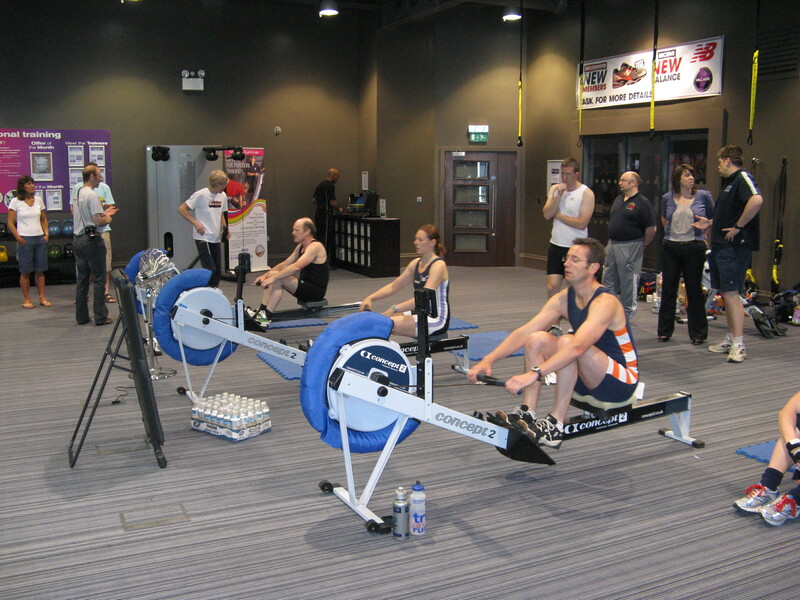 There is a lot to do and to think about when you’re running a venue erg race. When you’re racing in the erg race too that adds to the stress, especially when you want to race well. I’m not even thinking too much about the 100km World Record attempt that comes the day after the 5k races! A relative cruise through at just under target 5k pace, and a storming last rep to prove to myself (and ok, my competition too) that I was rowing well within myself. I’m feeling really good physically (and the shoulder and neck problem is almost completely gone now on Tuesday, and wasn’t affected by the session yesterday), and I know that on a good day I can beat all of the competition in my race on Saturday. As long as the mind is willing I don’t plan on saving anything for the 100k. I will be content with sub 17mins, I will be aiming for sub 16:50, and I will set myself up over the first half so that sub 16:40 is possible if it’s physically there. I really enjoy racing 5k, so am looking forward to the effect level required. We have 60 confirmed entrants for the 5k races, giving 10 full races of 6 people running from 1030 through to the last race start at 1545. 15 racing categories will be contested, and the winner of each will receive an engraved trophy. The trophies are the same as last year (except saying 2010), and are both unique to the Farnborough IRC and represent what Farnborough is most famous for. 2nd and 3rd position will get a Concept2 water bottle. We have 30 people confirmed as attending the post race dinner being held in the hotel restaurant between 1700 and 1830 on Saturday, following which we will then be socialising in the hotel bar as late as anyone wants to stay! We have 3 pairs going for 100km pairs world records on the Sunday beginning at 1000, and estimated finishing around 1630 to 1700. Spectators and supporters are welcome throughout the weekend, with all racing taking place at the Village Hotel in Farnborough. With a week now to go before my 5k race at the Farnborough IRC I had to get in some work at (or a little below) my planned 5k pace. The two sessions I chose for this week are the 6 x 1k from the 5k Pete Plan, and the 5 x 1500m from the original Pete Plan. A few other people in my heat for the race next Saturday were also doing these two sessions this week, so it is a good psychological boost to do the same sessions at a faster pace. I’ll be honest, this session felt tough on Wednesday. Having been doing the “Danish” style interval sessions going back ot 1min rest between reps feels quite different. In the past this session has been a good predictor of 5k pace for me though, so it was good to get through it on target pace. This session felt much better. A lot longer rest, and right on the “Danish method” of interval prep for a 5k race (equal work to rest, 150% of race distance). Having a fair bit left in the final rep to go 2 seconds quicker pace without increasing the rate is a great sign. Physically these two sessions tell me I am in shape to row around a 16:40 on a good day. Mentally I’m not quite in that sort of shape yet though. As I don’t believe I can go quite that fast yet it would be silly to go out aiming for that, as I’d set myself up to fail. Pace it for a little slower and if I’m in a close race coming into the last 1500m it will push me to a fast time though. I’m in a slightly advantageous position as the race organiser and having set up the heats from the entrant’s pb’s and predicted times. From these, and the form of the other entrants, I have a good idea what 4 of the other 5 competitors will be able to do, and as long as I have a good day I can beat all 4 of them. That just leaves the one person in my heat who is actually in my category. He has the fastest pb of the heat aside from me (and I’m certainly in nowhere near 16:33 form to worry that pb! ), and has been a close competitor in the challenge series for a few years. It could be a great close race, which will be fun. Due to work pressures yesterday I took a rest day. This was good timing as I didn’t really feel the energy or zip in my rowing on Sunday, so a rest day was obviously in order. It worked well, and I felt much fitter and stronger today on a moderate 10k with a fast finish. A proper sprint, but I was aware on the 10k in my legs when the final 100m rolled around! 10 days now until the Farnborough 5k, and the full race timetable has now been sent out to competitors. I had hoped to be in around 16:40 shape by this point so that I could row a little within myself and still set the fastest time of the day. As it is at least 4 of the 6 people in the final race of the day are capable of sub 17mins, and I don’t think I’m currently in shape to dip under by more than a second or two. It’s going to be a hard heat to win now, but I’m not one to back out of giving it all I can on the day to go for the win. There are a lot of races like that through the day, with many heats only seperated by a few seconds, so hopefully that will push a lot of people on to fast times. As well as winner’s trophies for the fastest person in each category there are also two prizes up for grabs for the fastest man and woman of the day of a free night’s stay in any Village hotel. Then the Sunday after the race is the day of the 100k pairs World Record attempts. Most of the people involved in those record attempts are “getting together” for a telephone conference tomorrow afternoon to discuss the various strategy aspects of an ultra distance record attempt of this type – this should be an interesting discussion, and I will be able to blog some more details tomorrow. asap if you see any errors or omissions. I always had the intention of doing a hard middle distance row today. The only time available to go to the gym was fairly early this morning, and as I was being joined for the session I couldn’t miss it even though I woke up feeling more like having a day off. After the easy session yesterday I should have felt great this morning, but woke still feeling tired, dehydrated, and just generally aching. I decided on the “easy” option of going right to the short end of the middle distance pieces with a 5k. A good idea with 2 weeks to go to the Farnborough 5k race to row through the distance anyway. My initial thought was to row 1:42.5 or so for the first 3k, then push in the final 2k to just dip under 17mins. It wasn’t to be today. I felt like I was missing top gear right from the start of the row, and had all but lost interest by 2k to go. It wasn’t intentional particularly to restrict the stroke rate, as of course 29/30spm is a more normal 5k stroke rate for me. From this I am confident that I can go under 17mins at the race in 2 weeks time, but 16:40 is a little way off just yet. My colleague who rowed with me did a few sessions when we were in Oman a couple of weeks ago. He picked up the basic technique very quickly, and is rowing more efficiently than 99% of gym rowers already. Still rowing mainly at low rates (20-22spm) he is pulling very respectable times already as well, pulling in a 2:03.7 pace for the 5k today. Hopefully he’ll keep up fairly regular erg work and can look back in a few months time when he’s doing double the distance at this sort of pace and see how far he’s come.